Matthew Dewey is a composer and music director based Sydney, Australia. He composes powerful, lyrical music for the concert hall, the theatre and for film. His first chamber opera was written and staged when he was just 18 and at the age of 24, his first symphony and first orchestral suite were recorded in Moscow by the Russian Philharmonic Orchestra. In addition to his work as a freelance composer, Matthew is the music director of Australia’s national classical music radio network, ABC Classic FM. 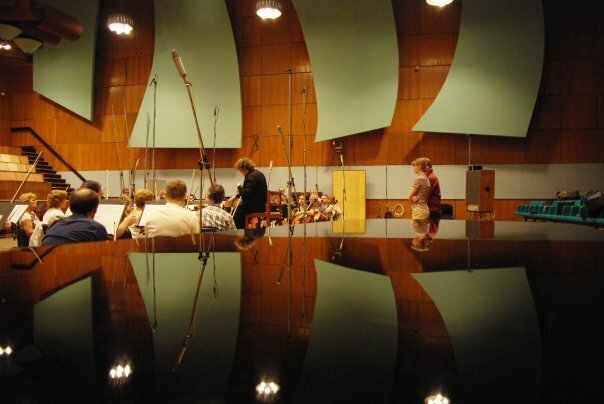 Recording with the Russian Philharmonic Orchestra. Photo of the orchestra across the top of nearby grand piano. Moscow Radio House, June 2009. Matthew’s compositions have been commissioned and performed by groups and companies including: The Russian Philharmonic Orchestra, Czech National Symphony Orchestra, Queensland Symphony Orchestra, IHOS Music Theatre laboratory, the Seymour Group (Sydney), The New York Miniaturist Ensemble (USA) the Sydney Children’s Choir, Hobart Chamber Orchestra, Hutchins String Quartet, Backgammon Baroque, Terrapin Puppet Theatre and by musicians including Jean Louis Forestier (Conductor), Edwin Paling (Violinist and Conductor) William Lane (Violist and Artistic Director of the Hong Kong New Music Ensemble), Joshua Rubin (Clarinetist – International Contemporary Music Ensemble), Harry Spaarnay (Bass Clarinet), Michael Kieren Harvey (Pianist), Sarah Jones (Soprano), Michael Lampard (Baritone), Christopher Richardson (Baritone), Karen Smithies (Pianist), Jabrah Latham (Saxophone) and Ben van Tienen (Pianist and Choral Conductor). He has composed four chamber operas “The Buzz of the Sea” (2008), “15 Years on Hold” (2007), “A Priest’s Passion” (2004) and “The Death of Chatterton” (2005); and released two full albums to date: Echoes, which features the Russian Philharmonic performing his 1st Symphony and Orchestral Suite No.1; and Liminality, a concept album that explores the quality of ambiguity or disorientation that occurs in the middle stage of rituals through sampled electroacoustic music. 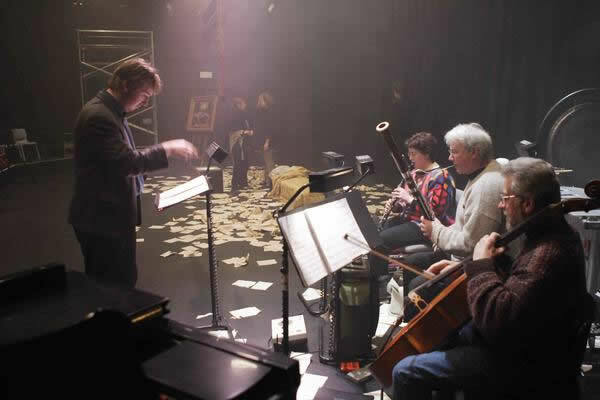 Matthew Dewey conducting a band rehearsal for The Death of Chatterton, September 2005. Matthew is tertiary educated, having studied composition under Professor Douglas Knehans (DMA Yale) and Constantine Koukias at the Tasmanian Conservatorium of Music where he received the Don Kay Scholarship for Music Composition and graduated with a bachelor of music majoring in composition. Subsequently, he undertook study in audio and music production graduating with a Masters degree in music technology from the University of Newcastle. He also holds a Masters degree in business administration from Deakin University, specialising in international business. For seven years he was mentored by Composer and Artistic Director of IHOS Music Theatre and Opera, Constantine Koukias, in composition, performance and theatrical design. During this time he worked as Koukias’ music typesetter and compositional assistant and worked on the opera “TESLA – Lightning in his Hand”; the sacred concert-mass “Pentekostarion – Prayer Bells for Federation” which was premiered at the Melbourne Festival 2001; Ancient Immortal Spirit (for TSO) (all three of which Matthew also performed in); “Prayer at Lamplighting” which was premiered by the China National Symphony Orchestra; and numerous other chamber music works. Matthew is represented by the Australian Music Centre. Recordings of his music are available for download internationally through iTunes.